Our Toxic Waterways: Flushing Away Our Future? Submitted by KAT on Fri, 03/05/2010 - 12:00pm. Big River Trailer from Wicked Delicate Films on Vimeo. Frustrated swimming pool owners in thousands of backyards across this country have posted a sign that pleads "We don't swim in your toilet, so please don't pee in our pool!" The message is crude but clear. Nobody wants to wallow in somebody else's waste--or our own, for that matter. So why do we treat our seas like sewers? Why do we contaminate our streams, rivers, lakes and oceans with a horrible hodgepodge of chemicals, pesticides, pharmaceuticals, plastic debris and waste? Evidently, the world's waterways are a giant toilet into which we can dump anything and everything, and then simply flush it all "away." As if river currents and rolling waves will pull our pollution into some giant cosmic garbage disposal. Industrial agriculture's synthetic fertilizers have given us lush green lawns and amber waves of grain. But the run-off from all those yards and farms seeps into our water table and feeds the "red tides", those toxic algae blooms that cause massive die-offs of aquatic plants and animals. Ian Cheney and Curt Ellis, the filmmakers who fondly documented their brief stint as Iowa corn farmers in King Corn, explore agribiz's downstream downside in Big River. In this thirty-minute sequel, Cheney and Ellis revisit their Iowa acre and trace its toxic trail all the way to the Gulf of Mexico. The film will make its Manhattan debut on March 15th at the Brecht Forum, followed by a panel discussion with Cheney, Ellis, King Corn director Aaron Woolf, Hudson Valley farmer and MacArthur genius Cheryl Rogowski, and Steve Rosenberg of Scenic Hudson. The screening is a benefit for the Food Systems Network NYC, a non-profit organization whose members (myself included) are dedicated to bringing fresh, wholesome foods to all New Yorkers and supporting our region's farmers, both urban and rural. Cheney and Ellis have chosen to go the grassroots route with the release of Big River, organizing screenings across the country in churches, schools, community centers, libraries, boardrooms and so forth. So if you're not in New York, check out their website to find a screening near you. Environmentalist Bill McKibben calls the film " a sharp and clever reminder that nothing ever really goes away, certainly not the soup of chemicals we're pouring on our fields." And Big River is more timely than ever in the wake of a flood of stories this past week about our nation's troubled waterways. When Cheney and Ellis revisit Iowa, they discover that Atrazine, the herbicide they relied on to grow their corn, has tainted the local creek. Just this week, scientists reported that this widely used weed-killer, which has contaminated the tap water of millions of Americans, is "chemically castrating"--and even feminizing--male frogs. Their gender is literally reversed to the extent that they can bear eggs. Atrazine is a known endocrine disrupter and suspected carcinogen. The European Union banned it back in 2004. Researchers in the US have called for a ban here, too, citing studies that have linked it to "human birth defects, low birth weight, prematurity and low sperm count." Nonetheless, we apply about 80 million pounds of Atrazine annually, and the Environmental Protection Agency has long insisted that it poses no risk. In October of last year, however, the EPA announced that it would "reassess atrazine's safety, including its cancer risk." Thousands of the nation’s largest water polluters are outside the Clean Water Act’s reach because the Supreme Court has left uncertain which waterways are protected by that law. Some businesses are declaring that the law no longer applies to them. And pollution rates are rising. ...a broad coalition of industries has often successfully lobbied to prevent the full Congress from voting on such proposals by telling farmers and small-business owners that the new legislation would permit the government to regulate rain puddles and small ponds and layer new regulations on how they dispose of waste. Glenn Beck is warning that passage of the Clean Water Restoration Act will result in the government regulating virtually every body of water larger than your birdbath. This could conceivably include the puddles of crocodile tears that Beck routinely weeps, and maybe even the pools of drool that accompanied his ick-inducing interview with Sarah Palin. Allowing the EPA to prevent industries from polluting our waterways is just bad for business, according to Beck. Never mind that letting manufacturers dump toxins into our waters is bad for us. For wingnut pundits whose populist veneer is thinner than the chocolate shell on an M & M, the concerns of common citizens must never be allowed to trump the needs of commerce. It's a view evidentally shared by mega developers the Toll Brothers, who withdrew from a proposed project along the Gowanus Canal in Brooklyn last Tuesday after the EPA finally declared the famously fouled Gowanus a Superfund site. Thanks to "years of discharges, storm water runoff, sewer outflows and industrial pollutants, the Gowanus Canal has become one of the nation's most extensively contaminated water bodies," the EPA declared. The Toll Brothers had grand plans to build 450 housing units and 2,000 square feet of retail space there. "We're extremely disappointed in the EPA's decision," David Von Spreckelsen, a Toll senior vice president, told the Wall Street Journal. "It's going to have a big impact on the properties along the canal...It's unlikely you are going to see development there for many, many, many, many years." Admittedly, this news is a colossal disappointment for all those would-be home buyers who longed to live by a canal whose signature stench betrays its industrial past: a heady blend of "cement, oil, mercury, lead, PCBs, coal tar, and other contaminants." But as the New York Times reported last year, "Studies have shown that property values decline after a Superfund listing but rebound after the cleanup, sometimes to far higher levels." Given the choice, most folks prefer their creeks and canals to be contaminant-free. Sadly, too many communities haven't got a choice. They're up a rancid river without a paddle, while Glenn Beck piddles on the truth and peddles his twaddle about puddles. Submitted by KAT on Fri, 02/12/2010 - 12:38pm. I don't want our kids to live diminished lives because we failed to step up today. I don't want them looking back decades from now and asking us, why didn't you help us when you had a chance? Why didn't you put us first when it mattered most? So much of what we all want for our kids isn't within our control. We want them to succeed in everything they do. We want to protect them from every hardship and spare them from every mistake. But we know we can't do all of that. What we can do...what is fully within our control...is to give them the very best start in their journeys. What we can do is give them advantages early in life that will stay with them long after we're gone. As President Franklin Roosevelt once put it: "We cannot always build the future for our youth, but we can build our youth for the future." That is our obligation, not just as parents who love our kids, but as citizens who love this country. I applaud the First Lady's attempt to rally the nation by casting this crisis as a problem that ought to concern any self-proclaimed patriot. But I'm really glad she didn't name the campaign the War on Waistlines, because we're already overextended in the metaphorical war department, what with the War on Drugs and the War on Poverty. Not to mention the actual wars we're waging in the Middle East. Or maybe we should mention them, because, as Michelle Obama noted on Tuesday, "Military leaders report that obesity is now one of the most common disqualifiers for military service." 75% of young Americans are ineligible to serve their country because they have either failed to graduate high school, engaged in criminal activity, or are physically or mentally unfit. This is no laughing matter, despite George Saunder's painfully funny Heavy Artillery piece in last month's New Yorker, a fictitious dispatch from an out-of-shape, soda-swilling soldier too preoccupied by snack attacks to fend off enemy fire. Whether you're a hawk or a dove, surely we can all agree that we've done our children a terrible disservice by allowing poor nutrition and physical inactivity to become the norm. If three quarters of our kids aren't fit to serve in the military, you've got to wonder how well equipped are they to succeed in civilian life? Decent jobs may be in short supply now, but supposing we could even get our economy back on track and create rewarding employment opportunities, what are we doing to prepare our youth for those good jobs? ...we know that solving our obesity challenge won't be easy - and it certainly won't be quick. But make no mistake about it, this problem can be solved. This isn't like a disease where we're still waiting for the cure to be discovered - we know the cure for this. This isn't like putting a man on the moon or inventing the Internet - it doesn't take some stroke of genius or feat of technology. We have everything we need, right now, to help our kids lead healthy lives. Rarely in the history of this country have we encountered a problem of such magnitude and consequence that is so eminently solvable. We could start by allocating more money to provide healthy school lunches, as Slow Food USA, The Healthy Schools Campaign, The LunchBox, and dozens of other organizations have been calling on the USDA to do. Imagine if, instead of subsidizing the commodity crops that form the cornerstone of our disease-inducing food chain, we channeled that money into the production of wholesome foods that would provide our kids with the nutrients they need? And if we provided kids with appealing outdoor activities and regular recess, we might be able to whittle down the number of hours they spend watching TV and being bombarded with junk food advertising, which has been shown to encourage more unhealthy eating habits. These may be common sense solutions, but to implement them we'll need to address a number of significant obstacles: insufficient access to affordable fresh produce; our addiction to convenience foods and a too-busy culture that doesn't leave time for real meals; a lack of basic cooking skills; and agricultural policies that favor processed foods. 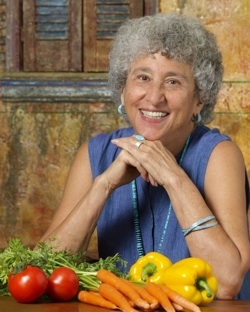 Nutrition professor Marion Nestle found much to commend in the Let's Move campaign, which has the potential to put these issues on the front burner. The campaign's success will depend on whether Michelle Obama and the many other participants in Let's Move can motivate parents and children to alter deeply ingrained habits. ...it is a challenging goal, indeed, but the percentage of American smokers dropped from 42 percent in 1964, when Surgeon General Luther Terry revealed the dangers of cigarette smoking to the American public, to less than 20 percent in 2007...Americans have shown a willingness to become healthier; on the issue of childhood obesity, we can do it again. So, if you really want to serve our country, you can start by serving real food. The Let's Move campaign is a serious call to arms, toned or not. Let's hope the nation heeds it.